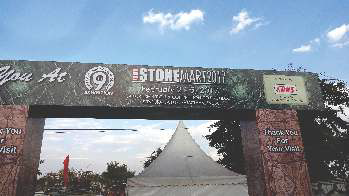 India Stonemart 2017 would be the largest international exposition on stone industry which would showcase the world of natural dimensional stones, ancillary products and services comprehensively. The event would bring together various stake holders of the stone industry viz domestic and overseas producers, exporters / importers, consumers and buyers, experts, technology providers, architects, builders, developers, corporates, etc. under one umbrella. India Stonemart 2017 would provide an ideal platform to the exhibitors to promote their products, services and brand image amongst the consumers from across the globe and establish business linkages and networking with them for enhancing their business horizon and prospects. India Stonemart has created a niche for itself in the international stone exposition scenario and the participants are offered best of the quality infrastructure, facilities and services. With the ever increasing number of exhibitors and a record number of business visitors, India Stonemart 2017 is an ideal springboard to negotiate business deals, network with the stalwarts of the industry and to simply do the business.